Get your vote on! 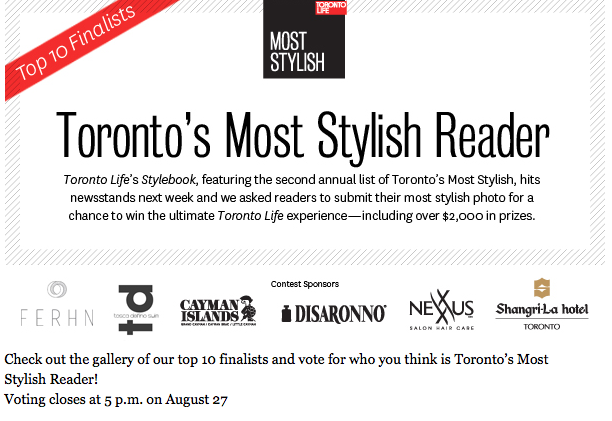 I’m one of the top 10 finalists for Toronto Life’s Most Stylish Reader contest and I’m calling on y’all to help me win. I’m truly honoured because I love this city and I love Toronto Life. I hope I can count on my trusty readers for your votes. It’s just 2 simple clicks to vote and you can vote ONCE PER DAY until 27-Aug. Would love if you could pass it on. Click HERE to vote. Thank you so much!! !